Truck application NOTE: Federal Excise Tax (FET) of 12% must be paid on the final selling price for trucks with GVWR's of 33,001 lbs. and above. Engine, Vortec 8100 MD gasoline V8, 295 hp (220 kw) @ 3600 rpm, 440 lb-ft (594 N-m) torque @ 3,200 rpm. - Maximum engine speed 4000 rpm with KZX air compressor and 4,200 rpm without KZX. Wheelbase, 140" (355.6 cm) - with 72" (182.9 cm) CA and 135.3" (343.7 cm) CE. 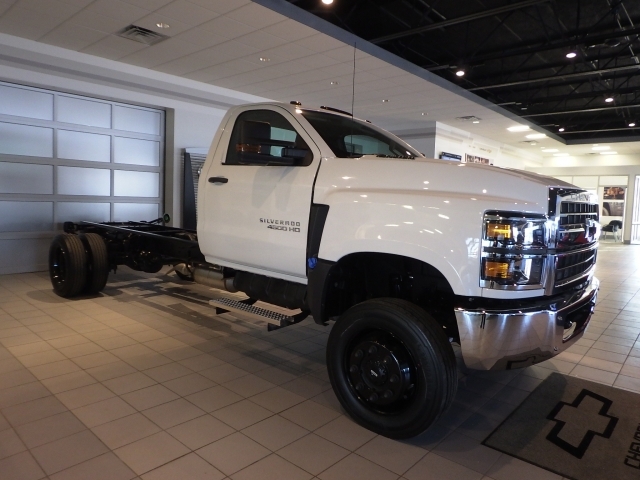 Fuel tank, single, 50-gallon (189.2L) fuel capacity - driver side, steel top tread plate, sump, drain and steps under cab on front passenger side and rear both rear passenger sides. Provides clean back of cab. Alarm: Automatic Engine Shutdown With Alarm / -includes Reset Feature. Exhaust System: Passenger Side Vertical Exhaust. (driver Side Horizontal Muffler) / With Rain Cap. Exhaust System: Driver Side Vertical Exhaust. (driver Side Horizontal Muffler) / With Rain Cap. Automatic Transmission: Allison 2500 (wide Ratio) 5-speed / -with 0.74 Over Drive. Torque Rating: 550 Lb-ft, 33,000 Lbs. (15,000 Kg) Maximum Gvwr/gcwr. Includes Transmission Oil Cooler In Radiator, Increased Cooling And Column Shift. No Parking Pawl Available. Automatic Transmission: Allison 2400 5-speed / -with 0.74 Over Drive. Torque Rating: 545 Lb-ft, 26,000 Lbs. (11,785 Kg) Maximum Gvwr/gcwr, Includes Transmission Oil Cooler In Radiator, Increased Cooling And Column Shift With Park Pawl. Automatic Transmission: Allison 3000 Rds Series (close Ratio) 5-speed / -with 0.75 Over Drive. Torque Rating: 960 Lb-ft,, Includes Transmission Oil Cooler In Radiator, Increased Cooling, Oil Level Sensor, And Instrument Panel-mounted Push Button Control. Automatic Transmission: Allison 3500 Rds Series (wide Ratio) 5-speed / -with 0.75 Over Drive. Torque Rating: 800 Lb-ft,, Includes Transmission Oil Cooler In Radiator, Increased Cooling, Oil Level Sensor, And Instrument Panel-mounted Push Button Control. Automatic Transmission: Allison 3000 Rds Series (close Ratio) 6-speed / -with 0.65 Over Drive. Torque Rating: 960 Lb-ft,, Includes Transmission Oil Cooler In Radiator, Increased Cooling, Oil Level Sensor, And Instrument Panel-mounted Push Button Control. Automatic Transmission: Allison 3500 Rds Series (wide Ratio) 6-speed / -with 0.65 Over Drive. Torque Rating: 800 Lb-ft,, Includes Transmission Oil Cooler In Radiator, Increased Cooling, Oil Level Sensor, And Instrument Panel-mounted Push Button Control. Manual Transmission: Eaton-fuller Fs08406, 6-speed / -with .078 Over Drive. Clutch: Provision For Clutch Throw Out Bearing Lubrication. Rear Tire Tread: Highway Traction, High C.g. Reinforcement: Inverted "l"-80,000 Psi (551,600 Kpa) Yield Strength. Reinforcement: Inverted "l"-120,000 Psi (827,400 Kpa) Yield Strength.